Well, #COP24 wrapped up with a commitment to implement the Paris Accords, but not before young Swede Greta Thunberg delivered a scolding message to the folks who are not treating Climate Change like the crisis it is. Striking her mark at the COP24 climate talks taking place this week and next in Poland, fifteen-year-old Greta Thunberg of Sweden issued a stern rebuke on behalf of the world’s youth climate movement to the adult diplomats, executives, and elected leaders gathered by telling them she was not there asking for help or demanding they comply with demands but to let them know that new political realities and a renewable energy transformation are coming whether they like it or not. “Since our leaders are behaving like children, we will have to take the responsibility they should have taken long ago,” said Thunberg, who has garnered international notoriety for weekly climate strikes outside her school in Sweden, during a speech on Monday. There is nothing in the laws of physics and chemistry to prevent humanity from stopping global heating getting out of control. Yet there is also no historical precedent for the scale and pace of the political and economic transformation that is needed to achieve that goal. 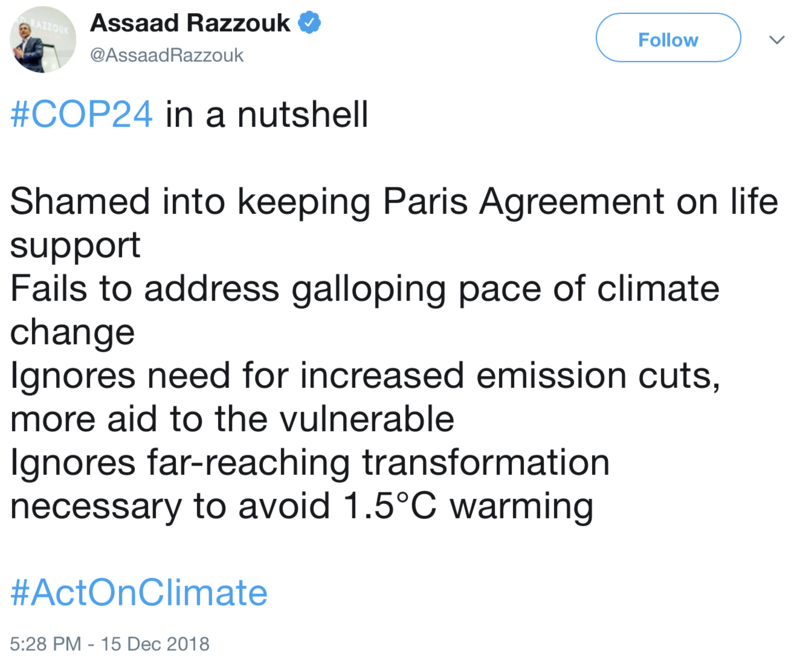 This was the message of the the Inter-governmental Panel on Climate Change’s(IPCC) ‘Special Report on Global Warming of 1.5°C’ (SR1.5), released earlier this year. While at the climate talks in Poland this week the leaders of the USA, Russia and Saudi Arabia have been explicitly arguing against using science to inform inter-governmental decisions, showing unprecedented levels of cynicism and irresponsibility, cities and their networks are clear: we welcome the clarity of the global climate science community and thank the IPCC for their fundamental work. C40, indeed, has adopted 1.5°C as our only science-based target since December 2016. It is indeed in the world’s greatest cities that our collective fate on this planet will be determined. As Al Gore has pointed out, the current generation of leaders are the first to benefit from unequivocal science and data on climate change. Those in office today are also likely to be amongst the last who are in a position to make decisions that will prevent global heating accelerating past 1.5°C. It is a big responsibility but also a huge opportunity to achieve change that will reap numerous immediate rewards, as well as incalculable benefits for generations to come. Allowing global warming to reach 2°C or higher will massively increase food insecurity, water shortages, poverty and take a devastating toll on human health. We are not on track: current commitments by national governments will deliver between 2.9 and 3.4 °C of average global warming by the end of the century. This is potentially devastating for human society. To achieve a 2 in 3 chance of limiting global warming to 1.5 °C we must reduce our global CO2 emissions to zero within the next two decades. Even if this is achieved, significant investments in adaptation are likely to still be required to reduce risks and impacts. However, adaptation has limits. Exceeding 1.5°C will lead us into a highly uncertain world where not all systems can adapt, and not all impacts can be reversed. Realistically, a 1.5°C world can only happen if major policy decisions are taken in the next four to five years. Each year we delay the start of emission reductions that the science makes clear we need, the window to reach zero emissions on a pathway to 1.5°C is reduced by two years. Each year, the task becomes more difficult and more expensive. Buildings and energy: New urban construction everywhere must consume near-zero energy by the 2020s. In the Global North, 5% of all buildings must be retrofitted every year from 2020. The C40 action commitment on Buildings, signed by 22 cities, 12 global businesses, and 4 states/regions is to make all new buildings net zero carbon by 2030. A sub-set of cities have also committed to only own, occupy or lease buildings that are net zero by the same deadline. Transport and urban planning: To hit the necessary emissions reductions from transport systems will require a major transformation in how citizens move around cities. Millions more journeys will need to be on foot or bike or avoided all together. Urban transport will need to run on electricity from a grid powered by renewable energy. The C40 action commitment, signed by 26 cities, is to make a major area of the city a fossil-fuel free zone, maximising cycling and walking, by 2030; and to only purchase zero-emission buses from 2025 at the latest. Green infrastructure: Trees, parks, green roofs and water features must come to dominate the urban landscape, helping reduce climate risks whilst also bringing down GHG emissions. Sustainable and resilient land use: Cities will be increasingly exposed to climate related floods, heatwaves wild fires and sea level rise. Planning decisions made today must help reduce those risks and prepare for those consequences. Sustainable water management: Waste water recycling, storm water diversion, and smart urban design can reduce the risks of climate related flooding and reduce demand for fresh water. 1. Energy grid decarbonization: Renewables will need to supply 70–85% of electricity by 2050. Cities and urban areas can only deliver their fair share of emissions reductions if the electricity grid is decarbonised. 2. Accountable multi-level governance: Local action and participatory processes are most effective when local and regional governments are supported by national governments. 3. Finance: To stay below 1.5°C, we can expect the level of investment to be orders of magnitude greater than previously thought. In the energy sector alone, it is estimated that we will need an investment of US$2.4 trillion annually between 2016 and 2035 to keep to the target. The sobering conclusion of the Summary for Urban Policymakers is that we need to pursue aggressive strategies to limit global heating to 1.5°C, while preparing our towns, cities for the climate impacts that are already happening. We have also seen in recent weeks that it is very easy to get climate action wrong. President Macron’s combination of tax cuts for the wealthy, along with fuel duty rises which have disproportionately effect those on lower incomes, has provoked a strong reaction across France. As a result, climate action is wrongly tainted as being unfair and reducing the social and economic well-being of the majority, while the one percent can afford to carry on polluting. Instead, climate justice and social justice need to go hand and hand. That is why we need inclusive and just climate action that delivers for all citizens in every part of the globe. Without urgent action, continued progress will become incredibly challenging. In this sense, action on climate change is development. Citizens are increasingly demanding action and changing their own lifestyles. Mayors can take heart from this and engage with communities to drive bigger changes. The Global Climate Action Summit in San Francisco this year showed the huge latent potential for regional government, business and cities to work together, whatever their respective national governments’ levels of ambition. Therefore, 1.5°C is likely to become the most important number in human history. It is already the target adopted by C40, since 2016, as the level of ambition needed to be part of our network. I am looking forward to working with C40 mayors and all our partners in 2019 to redouble our efforts to make this transformation a reality. Last-minute rows over carbon markets threatened to derail the two-week summit – and delayed it by a day. The summit accord, reached by 196 states, outlines plans for a common rulebook for all countries – regulations that will govern the nuts and bolts of how countries cut carbon, provide finance to poorer nations and ensure that everyone is doing what they say they are doing. Further tensions emerged last weekend, scientists and delegates were shocked when the US, Saudi Arabia, Russia and Kuwait objected to the meeting “welcoming” a recent UN report on keeping global temperature rise to within the 1.5C limit. In a compromise, the final statement from the summit welcomed the “completion” of the report and invited countries to make use of it. She said that countries like Russia- which had refused to ratify the Paris agreement because it wasn’t sure about the rules – could no longer use that excuse.